EasyTurf is scheduled to showcase their industry-leading line of Synthetic Turf at the Escondido Fair Oct. 19 in Escondido, Calif.
EasyTurf will join the community and other vendors and entertainers on Grand Avenue between Centre City and Ivy. The staff are excited to join their neighbors in this bi-annual event, and even more so to educated homeowners on the benefits EasyTurf has for them, according to David Hartman, EasyTurf President. The EasyTurf display includes an interactive look at the ingenious engineering involved in the creation of their artificial grass and proprietary MaxxFlo backing, an especially important point for pet owners. 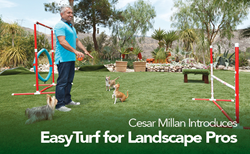 World renowned dog whisperer, Cesar Millan recently introduced EasyTurf artificial grass as his turf-of-choice for pet owners. Millan says drainage was critical in his decision to partner with EasyTurf on the 10,000 sq. ft. installation of artificial grass at his Dog Psychology Center in Santa Clarita. For more information about the Escondido Street Faire, visit w http://www.escondido.org, and for the latest in synthetic grass news, visit http://www.easyturf.com.